National long jumper and SEA Games rookie Matthew Goh may not have won a medal in his event today. In fact, he finished sixth. But there must be no doubt that the 18-year-old Singapore Sports School graduate must have still come away from the long jump final feeling like a winner. For despite finishing out of the medals, Matthew became the first member of the Singapore athletics contingent to break a national record at the Laos Games. He cleared 7.62m to smash his existing record of 7.53m which he had set at the South-east Asia Junior Athletics Championships in June. The distance is also a new national junior record. Matthew’s record-breaking jump occured in the first of his six attempts. However, he could not repeat or better the distance after that. He recorded a 7.50m on his second attempt and 7.41m on his fifth. His third, fourth and sixth attempts were all fouls. 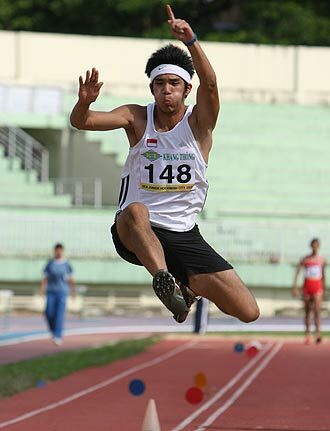 The event was eventually won by Thailand’s S. Sukhasvati who leapt the winning distance of 7.83m in his final jump of the day. Triple jump bronze medallist Joebert Delicano of the Philippines was second with 7.74m while his compatriot Henry Dagmil was third with 7.72m. Another reason why national jumps coach Valeri Obidko was smiling at Matthew’s record-breaking feat was because his protege’s new national mark also means that the Russian has now guided his stable of jumpers to 20 new national records and 18 new national junior marks since his arrival in Singapore in 2003. Yes, I agree completely. Great stuff, Matthew, and my heartiest congratulations to you. Meanwhile, Singapore won another gold in cuesports today, its second of the SEA Games. Former two-time world champion Peter Gilchrist, who became a Singapore citizen in 2006, defeated Myanmar’s Kway Oo in the English billiards singles final. Singapore also won the men’s and womens singles – in the SEA Games table tennis competition today. Both finals were all-Singapore affairs. Feng Tianwei defeated Wang Yuegu 4-1 in the women’s singles final while Gao Ning rolled past Yang Zi by the same score in the men’s final. The two victories means that Singapore has swept six of the seven gold medals at stake in the table tennis compettion. The one that got away was the men’s doubles crown after Gao Ning/Yang Zi and Cai Xiaoli/Pang Xuejie were beaten by Vietnamese opponents in the semi-finals. Note: You can go to this link for a previous story on Matthew which appeared in The Straits Times in June.